Back in April I attempted to host a virtual book club here at The Writeous Babe Project and it was an EPIC FAIL. My pal Mariam warned me. When I asked readers if I should host the book club online or IRL she said that "Online is too easy to back out of...I just think your participation will be much richer...if you do it in person." And boy was she right. Even I backed out of my virtual book club once I was buried beneath all the papers I have to grade at the end of the school year. So let's try this again. Sort of. This summer I'm co-leading a Church of the Highlands small group with my friend Jamie Golden of Jamie's Rabbits. For six weeks we'll be reading and discussing Restless by Jennie Allen. Are you feeling restless these days? I am. Don't get me wrong. I'm not bored. I have way too much going on in my life to ever be bored. But I am in a state of longing for what's next. I'm wondering what all the many things I'm doing right now are leading to and sometimes I wonder if they're leading to anything at all. Sometimes I feel as if I'm unraveling. And that's why I need to dig into this book and I need to dig deep. 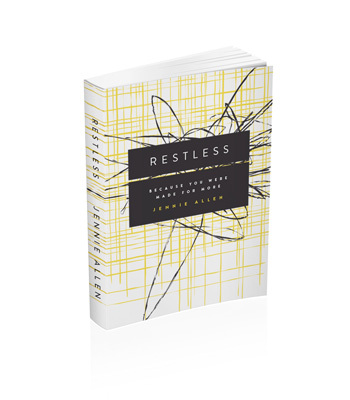 Restless is described as "a practical plan to identify the threads of your life and how to intentionally weave them together for God's glory and purposes." This book doesn't suggest that we add more things to our to-do list (thank God) but invites us to be still and see how God is already moving in our lives. Through this group we'll dig into five areas: gifts, suffering, places, people, and passions. This study promises to help me, to help us, untangle the thread of our lives and assemble them together in one place to reveal a beautiful plan designed by the Creator: God's Agenda + my threads + the need + the Holy Spirit = my purpose. So this isn't technically the Writeous Babe Book Club. It's a Church of the Highlands small group. But it's kind of like a book club only we'll meet weekly and there will be some praying and lots of Jesus talk. If you're a woman in the Birmingham area and would like to be part of this small group, email me at javacia@gmail.com for details. The group begins June 1 and we'll meet every Sunday from 4-6 p.m.
And I was just wondering what the new book would be the other day! Meh. I'd still be up for reading any feminist books you recommend.